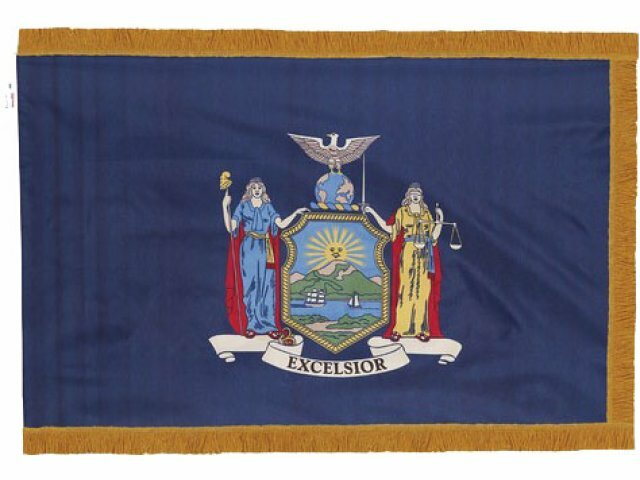 An Indoor New York State Flag is a great tool for teaching about symbols and history. Representing the values of freedom, justice and liberty, the state coat of arms which is imprinted on the flag also adds color to your space. When hosting formal events such as graduations, conferences and assemblies, having an elegant state flag displayed proudly at the front of the room will give the whole occasion a more official feel. A golden fringe frames the flag design and draws extra attention to it. While USA state flags alone are quite attractive, a few extra graceful touches make them even more appealing. 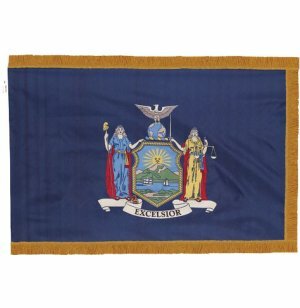 These US state flags are designed to display your state pride for many years to come. They are made of low-maintenance nylon which dries nicely and maintains its color for the long term. A user-friendly pole hem makes it easy to set up for events. The flag slides right onto your flag pole for quick setup and right back off again when it’s time to put it away. Aesthetic Enhancement: A gold fringe around the flag complements the design and brings out the colors. Easy Arrangement: A pole hem makes it easy to slide your flag on and off of a flagpole.